Linc Gasking is founder and CEO of 8i. Who Will Own The Virtual Reality Interface? In 2015, the virtual reality (VR) and augmented reality (AR) industry was widely heralded as the next tectonic shift in computing. But it’s also an industry that investors are cautious to enter while everyone’s cards are still face down. It may take years before mass consumer adoption, but in 2016 we still have a huge opportunity to help shape this industry. The thesis of VR/AR is that, as a new interface, it will take over many parts of existing interfaces, including real life, such as shopping, education and some forms of live entertainment — and, of course, the Internet. But the true magic and innovation is what we’ve only been able to imagine as part of science fiction: traveling back in time, teleporting to a different location and being with people who are no longer with us. Virtual reality makes all that possible, just not in the way we thought. You can now teleport to Mars or the top of Mt. Everest and be back in time for breakfast, travel back to the Roman Colosseum for a gladiator fight and capture your baby’s first steps for her family to revisit for generations to come. These completely new experiences, which VR and AR unlock (in addition to disrupting and enhancing existing ones), are what truly excite me, and many investors and VR industry folks with whom I’ve spoken. 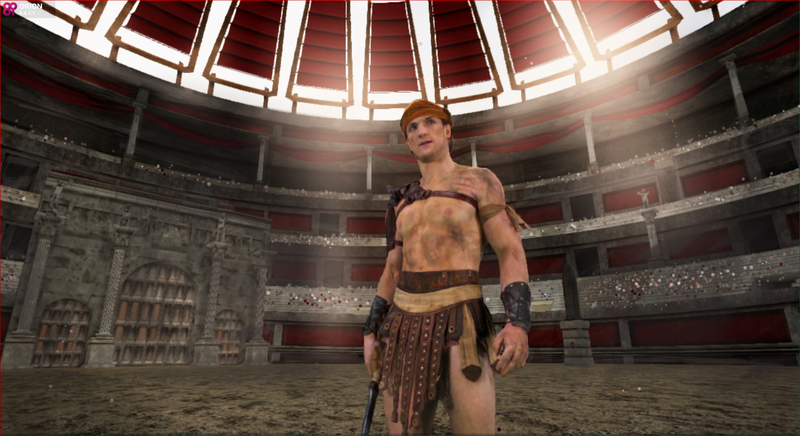 Logan Paul as a gladiator in the Colosseum. A scene from #100humans VR project, premiering at the 2016 Sundance Film Festival. Are VR and AR real? The most common question we heard from investors in 2015: Are VR and AR real? If you’ve tried virtual or augmented reality, then most likely your answer is yes. The true market size and opportunity is hard to articulate — you really have to see it for yourself. Time travel, teleportation and immortality will soon be within our reach. Explaining the vision for VR without experiencing it is like trying to convey the potential of the Internet in the early 1990s. This is one of the particular nuances of VR/AR. In a heavily interconnected world, the newest technology has only been seen by a few, and has to be delivered on a 1:1 basis. “I have a new VR/AR fund; what should I invest in?” asked a leading technology VC. Hardware. What became clear in 2015 is the volume and variety of VR headsets in production, ranging from the basic Google Cardboard (which could number in the tens of millions within 18 months), to Gear VR (which could eventually be giveaways with every mobile phone) and many Chinese competitors, to the high-end Oculus, HTC Vive and PlayStation VR. And on the AR side, of course, there’s Magic Leap, DAQRI and HoloLens, among others. Given the number of players in the space, it’s likely this will not be a “winner takes all” monopoly. And while the headset market is crowded and largely built out, supporting technologies — like eye-tracking and haptic feedback — remain hot. Content. There’s a huge upside for content that people are willing to purchase, most obviously in the area of gaming. And with eSports, or in this case vSports, there’s a whole social side to gaming that is yet to be built out. But in 2015, we also saw headset companies make strategic investments in niche VR content producers in order to drive mainstream consumer adoption beyond gaming. With media companies and Hollywood studios enthusiastically jumping into VR content, niche VR producers are getting slammed with too much demand and, in some cases, forced to outsource content creation to visual effects studios like ILM and Weta Digital. The best investors look for the opportunity that is truly transformative. Until tools become available to help democratize content creation, content will remain in the hands of niche players and won’t be able to scale to meet demand. But over time, as tools become readily accessible, we’ll see media companies and studios bring VR content creation capabilities in-house. In the meantime, we’re seeing VR producers maximize their perceived long-term value by turning themselves into distribution companies and developing their own IP. Software/Infrastructure/Tools. Just as it did in the PC and mobile eras, software is what will enable tools and apps for content creation and discovery — the picks and shovels for mining content gold. Over the next year or two as headsets come to market, it’s VR/AR software and infrastructure that will likely create the most untapped value. In November, an investor at a top Sand Hill Road VC firm told me he was shocked to learn how few investors in the Valley have yet to try true VR or AR. While the majority of tech investors haven’t made their first VR/AR bet, those who have are going in big. They are curious and proactive in seeking out innovative teams and trying out the latest tech. They maintain a high bar when it comes to finding the right teams and tech, even if opportunities were missed in the past. Traditionally, the best investors look for the opportunity that is truly transformative and won’t be displaced by something that comes along that’s only incrementally better. To find the right opportunities in VR/AR, it’s important to understand the ecosystem and where it’s moving, and to identify the technologies and teams that could truly advance the VR industry. Time travel, teleportation and immortality will soon be within our reach thanks to VR and AR, as will many other things we had only imagined in science fiction… and some we haven’t imagined yet. That’s even more exciting! So while there’s a lot of work to be done, resources needed and risk involved, I for one am very excited about what 2016 holds for VR/AR and the incredible opportunity we have to help pioneer the next computing era.